I personally love being organized and prepared. Being organized and prepared at Disney will help you have a much more enjoyable trip. Ziplock bags are inexpensive and very handy to have. Here is a list of 10 reasons you need to have them for your Disney trip. 1. Use them to pre-pack all of your kids outfits. One outfit per bag...clothes, hair bows, shoes, etc. In the mornings, all you will have to do is grab a bag and get themdresses. It will also be easy when having your spouse help get the kids ready. Also, dont forget to throw an extra bag of stuff into your bag you are bringing to the parks. Having an extra outfit is very handy. Kids make a mess, get too wet, have an accident? Just use that Ziplock bag (that is now empty) to store. 2. Use a bag to store your phone and camera in during water rides. 3. Emergency Barf Bag...self explanatory. 4. Use a bag to keep sunscreen, hand sanitizer, etc. That way if they leak, there won't be a mess all over your bag. 5. Unfinished Meals....bags come in handy for leftover snacks and meals. 6. Put the remote control from the hotel in a bag. Think of how many people touch that thing...and the germs! You can still switch the channels through the bag. 7. Use a bag to save all the little memories for scrapbooking or crafting purposes...tickets, receipts, confetti, napkins, etc. 8. Use bags to organize your park bag...snacks in one, little activities (crayons, coloring books, bubbles, glow sticks, etc) in another....and so on. 9. Use a bag to store all of your character autograph stuff. Whether you are doing a traditional autograph book or a photo mat, you will need a space to keep your pens/markers and the actual autograph book/mat. Having it in a bag prevents anything from spilling on it. 10. Make a mini diaper bag...diapers, wipes, powder...have it in an easy to reach place. A bag keeps it all together. 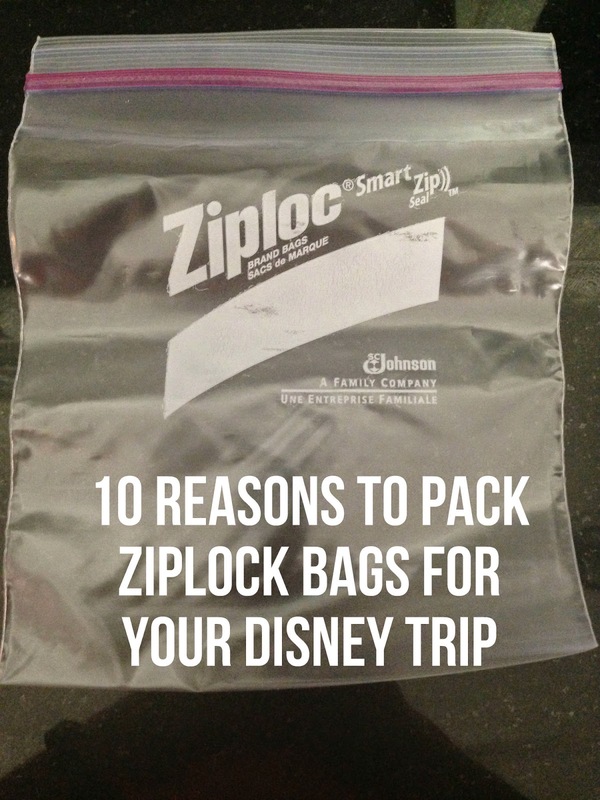 Do you have any other ways that you use Ziplock bags at Disney?